Experimente a magia de cruzar o Nilo em uma inesquecível excursão de dia inteiro a Gizé do Cairo. Juntamente com um guia especializado em egiptólogos, contemple a icônica Grande Pirâmide de Gizé e receba uma fascinante introdução à antiga história da estrutura. Admire a resplandecente máscara de ouro de Tutancâmon no Museu Egípcio; desfrute de um almoço egípcio tradicional em um restaurante rústico; e absorver o charme histórico da Cidade Velha do Cairo em uma visita guiada. Conclua sua excursão com um cruzeiro romântico pelo rio Nilo; a bordo, delicie-se com uma refeição gourmet e uma apresentação de dança tradicional antes de retornar ao seu hotel no Cairo. Go see the man of Egypt. Mahmoud HOKA Ahmed this tour will not disappoint you in anyway. The gudie or ishould expert will make this more then memorable for you and your group.It is just what it says a full day and you see a lot. Above seeing you learn a lot.Hoka knows his stuff and I would say to anyone anyone ask for him as your Egyptologist you will think at the end of the WOW what a day I had. What an amazing Experience!! This was my first trip to Egypt and I could not have been in better hands to explore this wonderful city Heba A. Amer !! She was delightful and a very entertaining /informative tour guide! The whole time I felt treated as a welcome guest never like a tourist. The tour was magnificent! Since I've already seen the Giza Pyramids, Heba was gracious to accommodate me and tailor some new areas to explore. 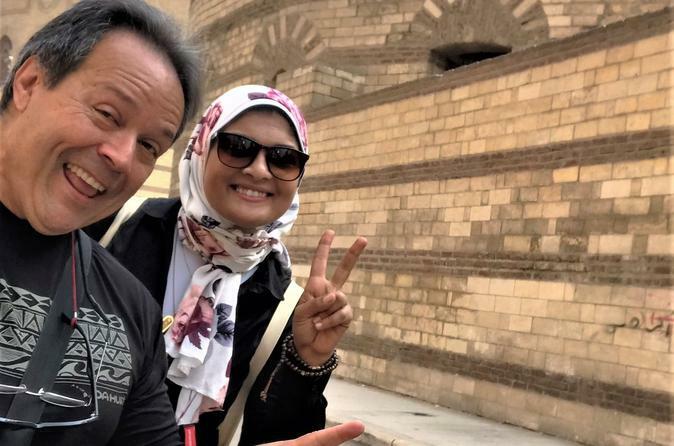 People like Heba makes visiting Egypt a delightful experience you want to repeat over and over. We had the pleaser of having Mohamed Osama as our guide on this tour from Let's Explore Egypt. He discussed in great detail the history of the Giza pyramids, Sphinx, and the history regarding the hanging churches and the oldest Jewish synagogue in old Cairo. Mohamed is an excellent guide that you are certain to learn a lot from. Had an amazing day and a half tour with Mohamad aka Mady. First day we toured the Cairo Tower, Nile River sailing and Mokkatam Hills and finished the night with a great dinner of koshary. Second day we toured the Pyramids of Giza, The Great Sphinx, Egyptian Museum, Coptic Cairo, Khan El-khalili Bazaar, dinner cruise with belly dancer. Mady was awesome always making sure I was filled in on all of the details we were visiting and in-depth of all of the history. He was also a big help in making sure I picked up meaningful and authentic to Egypt only gifts and items to remember my time here in this great country. I would highly recommend a tour with Lets Explore Egypt and for sure Mady as your guide. You will not go wrong and the experience is sure to be very special and personal to you. If I could give 6 stars I would. We took this private tour with Waleed as our tour guide. We just loved it! Waleed was well-informed, accommodating, and most importantly funny! He knows a lot of details about ancient Egyptian history and is passionate about it. It was clear that he really wanted to be sure we had a good time. He also offered to take a lot of photos for us - he knew all the great shots, too. Thanks, Waleed! We'll absolutely book again if we go to other parts of Egypt. Our tour guide Zenab was very informative and well versed with her job. When we went to the museum, she showed the highlights and gave us lot of information on Egyptian history. There was no need for us to have a separate museum guide. We also had good conversations about general life in Egypt. She was enthusiastic and made our trip fun. She discussed with us what our interests were and planned the trip accordingly. The service was prompt, they guide and the driver were always there on time, courteous and very well organized. AMAZING AMAZING AMAZING!!!! Our tour guide was super knowledgeable, we learned so much with him and knew how to take pics! D He was very patience and very passionate about the history of Egypt! The tour was simply amazing!!! My friend and I simply LOVED IT!!!! This was an amazing one day tour of Cairo and GIza that hit all the sites I really wanted to see in short time available. It started with a tour of the Egyptian Museum that highlighted the amazing history of this country. The exhibits were very informative and seeing the statues, mummies, jewelry, sarcophagus, and the many features of the ancient history of Egypt was a thrill. From the Egyptian museum we proceeded to Giza to see the pyramids and sphinx. There was an excellent lunch before we went to the Pyramids that provided some time to relax and recharge. After the lunch we went to the Pyramids and the Sphinx. This was a lifelong dream to see these magnificent historic sites. There was even time for a camel ride as well. Following that and because we had some time before the evening dinner cruise on the Nile, we stopped at a perfume show, then a silver shop, and, finally, a Egyptian cotton linen shop with plenty of time to see everything and make some purchases. After that we went to the boat and had the chance to see the sunset over the Nile River. There was a very nice dinner onboard that was buffet style and then some great entertainment, a singer, a belly dancer, and then two dancers doing some incredible twirling around the floor. This was very unusual and was fantastic. So, by the end of the day I had seen the things I had most wanted to see, had plenty of time to enjoy them, learned so much, and had time for even more surprises. I cannot say enough about the best tour guide you will ever have, Manar Atwa, and the driver Hamdi. Manar is an expert on Egyptian history, has advanced degree in Egyptian history and architecture, and can tell you so much you will be absolutely amazed. Manar is the best. Hamdi told me that to drive in Cairo you need three things: good horn, good brakes, and good luck. Well I can tell you that you need a forth, and that is a good driver and Hamdi is great driver. I highly recommend you take this tour and see the main highlights of Cairo and enjoy the whole day. But do it with Manar and Hamdi. They are great and will make you day tour memorable. We used Viator to book a tour and they turned up on time in a clean air-conditioned car. Zenab was our tour guide and Hossam was our driver. Because there were only the two of us Zenab gave us a tailor made programme. The nicest thing was that she listened to what we wanted and took us to the Pyramids, Egyptian Museum and to both tour shops and 'real' speciality shops. As we live in an Islamic country rather than visiting mosques she took us to the Hanging Church and St George's Church. She also took us to lunch and in the evening we went on the Nile for dinner. It was a long day for her, and us, and she made it a day to remember.